Mastermind PBC/10 | RJM Music Technology, Inc.
More powerful than most dedicated MIDI controllers! 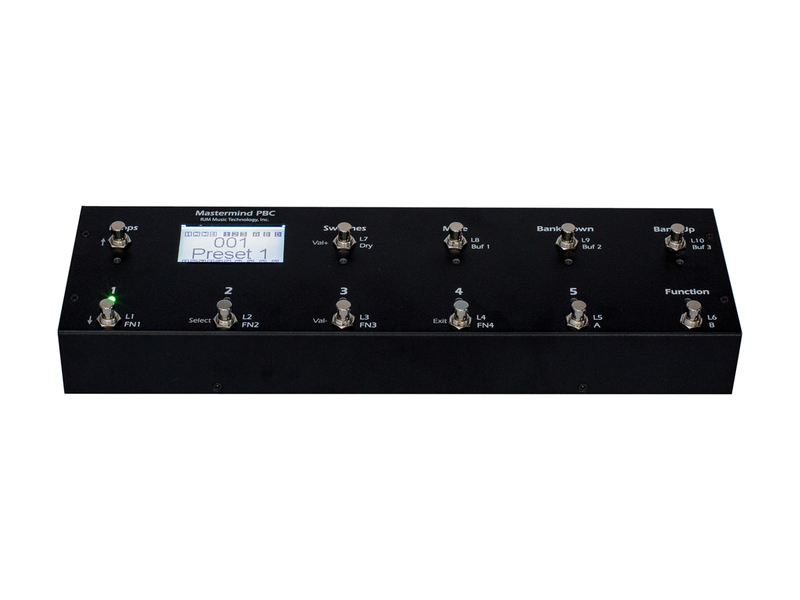 The Mastermind PBC/10 is our first switching unit designed for use on a pedalboard. This product combines best of all of the products we’ve done over the years into one compact and powerful unit. 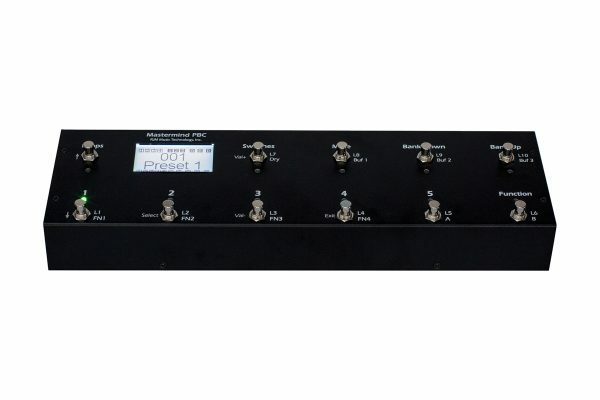 This gives for the first time, the power and flexibility of a rack switching system – on a pedalboard! 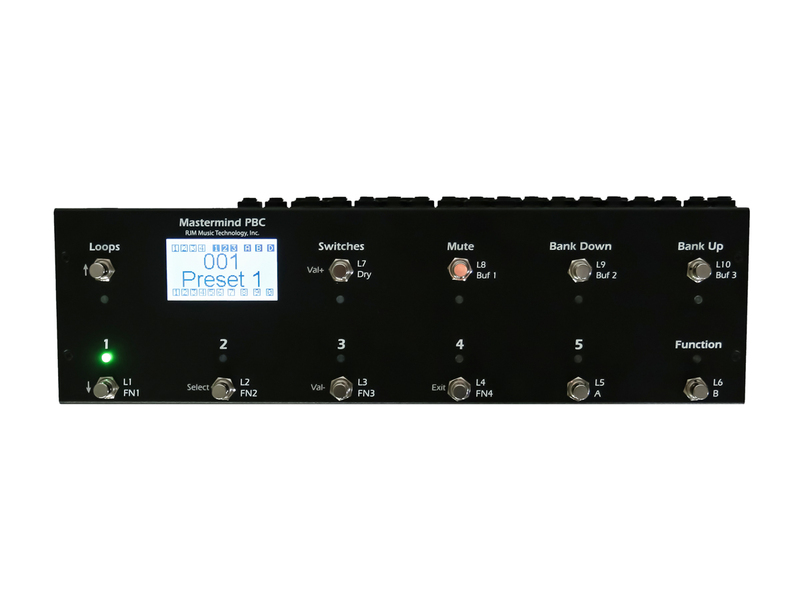 We’ve designed the Mastermind PBC/10 to get the most out of pedalboards that include MIDI controllable pedals like those made by Eventide, Line 6 and Strymon. Not only does the PBC/10 handle all of the audio routing and switching, but also its comprehensive MIDI features allow complete control over these pedals. Most amps that have one to four 1/4-inch footswitch or external switching jacks are compatible with the Mastermind PBC. The exception to this is any amp that has a footswitch that has one 1/4-inch plug but more than two buttons. These footswitches use proprietary electronics and are not compatible with the Mastermind PBC. The Mastermind PBC/10 can control all of your analog and digital effect pedals. You have 10 audio loops at your disposal and you can organize all your pedal combinations into presets, songs, and build out setlists. How is the Mastermind PBC different from the GT or LT? The Mastermind PBC shares all the functionality of the GT and LT. The biggest thing that sets the PBC apart is the fact that it has audio loops. In addition to being able to control MIDI devices, the Mastermind PBC can switch up to 10 pedals in and out of your signal path. Switching effects can be done manually in Loops mode, and you can program loops to turn on or off in each preset. This gives you the ability to switch all of your effects, analog or digital, with a single button press. The PBC stands for Pedal Board Controller and it truly lives up to its name. How complicated is the Mastermind PBC to set up on my own? The Mastermind PBC is extremely easy to set up. Connect any pedal(s) to a given loop. Turn the pedal(s) on and leave it on. The PBC will control the on/off status of the pedal depending on how you program it. No more tap dancing. Do I have to do all my setup on the PBC or is there editor software? Simply put, you can make changes on either the device itself or in the editor, without having to have the PBC in front you. Just connect your device to your computer with a USB cable and write the changes you’ve made. You can also import changes made on the PBC into the editor and save them. The Mastermind PBC comes with a software editor, (Mac and PC). You can find the link to download the editor you need in the buttons above. How does the Mastermind PBC differ from other switchers on the market? Is the Mastermind PBC “true bypass”? Is the Mastermind PBC compatible with my _______ ? Visit our online store to order your Mastermind PBC today!